It was early November, 2005 and I had recently returned from a pilgrimage to Vat Phu in Champassak, Laos. Vat Phu is a 5th century temple and was dedicated to Shiva. In the 9th and 10th century more additions were added to the Vat Phu complex by several Khmer Kings all of who left statuary extolling the mythology of the Hindu epics of the Ramayana and Mahabharata. Much of my visit to Vat Phu was uncovering the extent to which Hinduism had migrated to Southeast Asia and was included in most all of the religious ceremonies throughout Cambodia, and Laos. 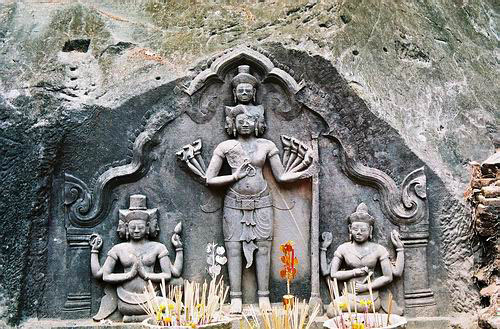 The extent to which Vishnu, Shiva and Brahma were honored can clearly be seen in the ancient temples that were built between the 5th and 13th centuries throughout Southeast Asia. Buddhism gradually replaced Hinduism in Southeast Asia, but many of the rituals and the gods of India can still be found embedded in the modern day temples of Thailand. So much time has passed from those early centuries that many people in Thailand today have no idea of who these Hindu gods are and for the most part lump them all together as a greater part of Buddhism. I can remember standing in front of the 9th century stone carving of the Trimurti at Vat Phu when some tourists from Thailand walked by. I was astonished that they did not know who the gods were that they were looking at. I had pointed to the center god and said that is Shiva and they never heard of Shiva. They thought it was an image of the Buddha. But then on November 13, 2005, three weeks after I had returned from Vat Phu a news article appeared in the Bangkok Post featuring the Erawan Shrine that is at the Ratchaprasong intersection next to hotels and exclusive shopping centers. As it turns out every November 9th there is a celebration at the Erawan Shrine honoring its being placed in this location in 1956 prompting the article in the Bangkok Post. Its impossible not to be aware of this shrine as hundreds of people daily are usually paying their respects, hanging floral garlands on every available place around the shrine and lighting incense to the Hindu god Brahma. It's truly a very holy spot in Bangkok and what made me pay attention to the news story titled "A Matter of Faith" was that the main reason people paid respects to this shrine was to bring about good fortune and an answering of requests for success. In fact the whole rationale for placing this shrine next to a very large hotel was to bring about prosperity to the business. The article goes on to explain why there are other Hindu shrines in the immediate area such as Indra, Ganesh, one of Shiva's sons, a Trimurti and even Vishnu riding his celestial mount the half bird half lion Garuda. Many times I would stop at the shrine to listen to the chanting and watch the Thai dancers. But, the way the article was written was so very different from the impressions I had brought back with me from my pilgrimage to Vat Phu where all the gods were sitting on a mountain top over looking the great MeKong River next to the sacred mountain called Lingaparvata (the linga of the mountain) honoring Shiva much like at Mt Kailash in the Southern Himalayas where it is considered the abode of Shiva living with his heavenly consort Parvati Uma. The entire money aspect that was so predominant in this article left me with a very empty feeling as if the sacredness of the great god Brahma, the god of creation, had been recast as a god that would grant wishes to every desire for wealth and prosperity. In fact the property owners depend on these Hindu gods for the prosperity of their businesses. After seeing Brahma sitting in his lofty peak at Lingaparvata in Laos I found it strange that he would end up in the busiest intersection of Bangkok and be revered as Bangkok's most sacred shrine sharing that honor with the Emerald Buddha at the Grand Palace. Brahma sitting at the Erawan Shrine commands the attention of tourists from all over Southeast Asia and the world. Brahma's power to honor prayers and bestow success on his devotees was never so obvious as it is at this shrine and people were even quoted of giving testimonies of Brahma answering their prayers. So for all the Buddhas that exist throughout Thailand you will also see many similar shrines enclosing the four faced Brahma as if Hinduism was still very much a part of the southeast asian religious mindset. But my guess is that most Thais do not see this god as a Hindu god, but only as an aspect of the Buddha. The point that was being made was that the Erawan Brahma shrine was enormously powerful and could answer peoples prayers, wishes and desires. Another kind of story was unfolding that wouldn't become known for a little over 4 months. It was a story of a young man who for many years had been in and out of psychiatric hospitals since he was 21 years old. This is a story of Thanakorn Phakdeephol a man we know very little about. His father said he saw him leave the house a little after mid-night one night showing the same signs of mental illness he had seen before. Then his father, Sayant, who was listening to the radio in those early morning hours of March 21st, 2006, heard a report of a man found beaten to death with anti-allergy pills found in his pants. The report continued on to say that his assailants had chased him down the street and hit him on the head as did many others wherupon he died on the spot with blood flowing down the street. Saynat knew it was his son and went to the police station to confirm his suspicions. Thanakorn Phakdeephol carrying a large hammer walked up the sacred Erawan Brahman shrine and with thoughts we will never know about took it upon himself to completely demolish the shrine. It would be many more hours before Bankokians would wake up to the morning news to learn of the Erawan Shrine (Phra Phrom) being destroyed. But in those early morning hours from 2am to 6am it was reported people were weeping at the base of the shrine. At first it was only a few and then slowly people began to arrive in the hundreds weeping and fearful that some unknown terrible fate had entered the land. The newspapers were working on the release of their story. What kind of person would commit such an act of destruction. Surely this was the doings of a deranged man. But in defense of this man, which I have never seen printed anywhere, we have to look at what kind of environment he was living in. In those early hours a stirring of mythological proportions was taking place that Thailand was not aware of. Prime Minister Thaksin Shinawatra was fighting for his political survival and during those early morning hours Thaksin was in Buri Ram riding an elephant and participating in ancient Khmer rituals as if going into battle. This was reported in the Nation newspaper on March 24th. 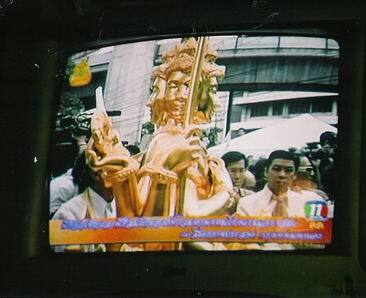 Thaksin crossed over into Burma knowing that the sacred Erawan Shrine had been destroyed. The desecration of the Erawan Shrine came at a time of the most severe political turmoil Thailand has ever seen. It is not only Thanakorn Phakdeephol who was feeling the social strains. People from all walks of life were experiencing difficulties with an era in Thailand that has been characterized by unfettered capitalism, greedy economic growth, and a level of corruption in politics that seems rampant beyond control. The Nation newspaper on March 22nd stated that the Thaksin era is best by evil omens. People are suffering higher prices for basic necessities, and in the south there are murders on a daily basis, unchecked, and now reaching over 1,200 deaths in a little over a year. Thanakorn Phakdeephol could not tolerate it any longer and much like the terrorists who slammed into the World Trade Center in New York city, a symbol of money and wealth by the largest nations, Thanakorn took a hammer to the Erawan Shrine; the symbol of wealth and prosperity in the heart of Bangkok. When the people of Thailand woke up on the morning of March 22nd and learned what had happened as the blood stained street where Thanakorn Phakdeephol was still fresh the inconceivable had presented itself to the nation. Brahma had been destroyed. Thaksin was in Burma and many people felt fearful and saddened beyond anything they had ever experienced before. The visible outpouring was greater than anyone had seen before which was a testimony to the perceived power Brahma gave to his devotees. It would take two months before the shrine could be restored and on April 5th, a little over two weeks, Thaksin Shinawatra left government house and his duties as caretaker of the Nation. The demonstrations leading up to the ousting of the Prime Minister were the largest in the history of Thailand. Coinciding with all this drama of the Erawan Shrine King Bhumibol was preparing for all the celebrations for his 60th anniversary to his accession to the throne. May 5th, coronation day, was to be celebrated, and on that day Brahmin priests were going to present the king with a sacred urn filled with holy water from five of the most sacred rivers in India. Again, the ancient rites performed by Brahmins was again a sign that the real spiritual substance that lie in Thailand was gained from Hindu roots. Without Thaksin Shinawatra acting as the leader of the nation the King's 60th anniversary became the rallying call for all the Thai people. It was in their King the Thai people were able to find peace of mind. It was the King who came forward with advice on how the nation could reach some balance in its obvious turmoil. Then on May 19th the announcement came that the new statue of Brahma was complete. Installation ceremonies would take place on May 21st. The procession through Bangkok streets was something right out of the past with Brahmin priests in tall conical white hats carrying the statue on a bed of flowers. The people were gathered by the thousands in pouring rain and the statue finally arrived at the Grand Hyatt Erawan Hotel. The following day Thaksin Shinawatra returned to his duties as caretaker of Thailand as if nothing had ever happened. But something did happen. Unlike my pilgrimage to see the holy water at Wat Phra Si Maha Uma Devi on April 30th I was unable to attend the installation of the new Thao Maha Phrom statue in Bangkok. I was in the small village of Bangta-nagai in Banphot Phisai. I knew at 11:59am the statue was going to arrive at its final destination. What I didn't know is that it would be televised. 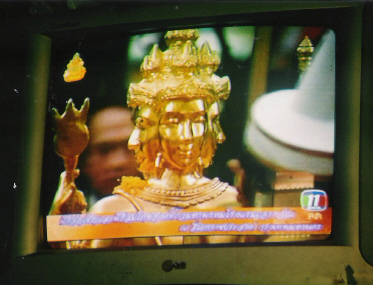 So, when I saw the throngs of people gathering around the sacred Brahma statue on the television screen 250 kilometers north of Bangkok I was aware that all of the Thai nation was looking at Brahma. Brahma the god of creation shinning in radiant gold with the subtle sounds of drums and bells in the background and the feeling of a larger than life ceremony, as ancient as ancient India, was being re-instated in Bangkok. I took out my camera trying to take pictures off the television screen. I knew they would be nothing like the photos I could take in Bangkok, but I wanted to see if I could capture an image of the new statue of the sacred Brahma. It was a very unusual feeling I got from watching the ceremony through the lens of my camera. It was a small viewing space and I held the camera close to my eye as I watched the procession. Every once in a while there would appear a close up of the four faces of the Brahma and I wanted to photograph it. The procession was more difficult because everything was moving making it difficult to focus on the television screen. Then came the most unusual part of the ceremony. The offering of fruits and foods was displayed before the shrine and two Brahmin priests appeared. 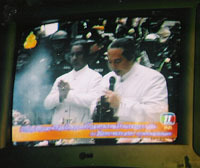 One of the priest was given a microphone and began to quietly chant. But then the chanting took on a very unusual sound unlike any of the chanting I had ever heard by Buddhist monks. This was a Brahmin priest giving his blessings and his blessing superceded any sound I had ever heard before. The pace at which he was chanting defied ones understanding of how a language so old could still be delivered flawlessly. His voice was mellifluous and the priest created a magical tone with his voice. I had never heard anything like it before. I knew at that moment that something very sacred was being transmitted. When I had my film developed I had noticed a white fuzziness on the picture where the Brahmin priest was giving his blessing. At first I assumed it was a light leak but then I realized I was in a dark room without any outside light to interfere with taking the pictures. Its easy to say its a distortion or a reflection, but then I looked at the shape of the white discoloration on the picture. If I looked at it quickly I could faintly see a shape as if someone were in a praying position. I could make out the head the nose and the hands brought together. It looked as if someone were praying at the same time as the priest was chanting. The same white discoloration could also be seen over the food on the table but much smaller in size. Brahmin priests chanting with a strange apparition. That day in Bangkok was a very special day for Thai people. It brought together people from all over southeast Asia to pay respects to the Brahma. And maybe, just maybe, it was the spirit of Thanakorn Phakdeephol participating and honoring the deepest significance of the meaning of Brahma. Maybe Thanakorn Phakdeephol felt helpless and had no where to turn. Perhaps he felt the world had given up on him and he smashed the symbol that didn't give him anything but only torment and sadness. So as we go to Brahma lets at least ask for the well being of all the people on this beleaguered planet and not be so concerned for our own personal wealth and desires. Lets think of all the people in southern Thailand that are no longer here, all the tribal people rushing to the Thai borders from Burma, the land Thaksin banished himself to while Tha Phrom was in rubble. And all the people across this planet who need food and a place to sleep. For those of us who are wealthy and powerful lets go to Brahma, the God of creation, and ask for a holy land where all can share in the bounty of the universe and not be so self centered and only think of ones personal wealth. This could very well be an image of the spirits of all those deceased souls praying that those will be the kind of prayers that will be heard from now on. In Thanakorn Phakdeephol's rage and in his death he has given all the Thai people an opportunity to reflect on what it is that is truly important in this life. It is not just the acquiring of money, but the adjustment of resources so each individual can experience his or her potential as a human being to continuously provide more opportunities for the human spirit to flourish and help create a planet that will sustain all of us for millenniums to come.